The Great British High Street is renowned for its inability to agree on what exact measurements determine standard dress sizes, at times making us feel all kinds of sh*t about ourselves tbh. Lowri Bryne - who's a size 12 - had a cruel reminder of this when she treated herself to a spot of retail therapy, only to discover she was three sizes bigger in one popular womenswear store. H&M is notoriously unkind to women when it comes to its sizes and one outraged student has rightfully outed the Swedish fashion retailer for its unjustifiable small fittings. Lowri Bryne - a modest size 12 student from Swansea - was gobsmacked to discover she needed a dresses three sizes big as she was unable to breathe in her usual size 12. 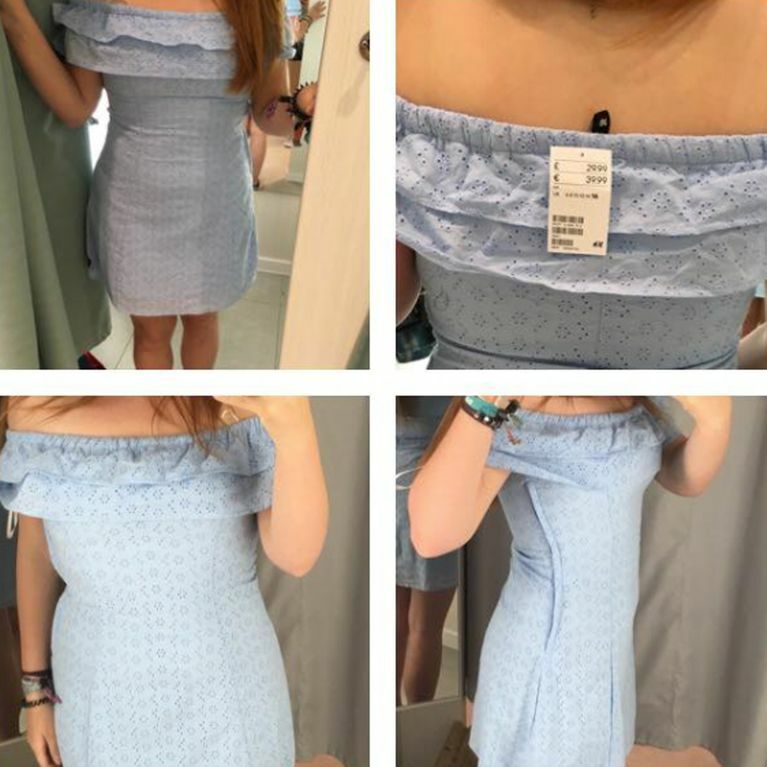 Lowri took to H&M's Facebook page to share photos of the ill-fitting dress and explain why it's imperative they fix their sizing system. She wrote: "Please sort your sizes out because this is absolutely ridiculous! "I'm a size 12 and small busted and today in a H&M store I had to ask if this dress came in a size 18 (it didn't...). The dress I have on in these photos is a size 16, and I could barely breathe. Not only was this annoying because I wanted to buy this dress, but so many women take what size dress they buy to heart. If I was one of these girls (thankfully I'm not) requesting a size 18 dress would seriously devastate me! "When I asked if this dress came in a 18 the store assistant said 'ahh yeah you have to go up a couple of sizes with these'. A couple?!? Going up 3-4 sizes surely should make you realise that you need to seriously sort out sizing!!!" Lowri's post clearly resonated with female Facebook users as so far it's been shared almost 200 times with many women commenting about their similar experiences. "I'm a size 10 and have to buy 16/18's in H&M! However ladies just to let you know... Tesco is the opposite and I slid into size 8 jeans," one wrote. "H&M are ridiculous now. I can go in to Primark & pick up a top and leave. I don't even need to try it on! If I go in H&M now I need to pick up three and try them on to then be heart broken when I'm wearing a bigger size than necessary! No wonder they always have sales they can't get rid of the stuff due to awful sizing!" another added. H&M are yet to comment on the matter.